Chrysler CEO Sergio Marchionne: “This is a story of revitalization in a company that was regarded as irrelevant, set in a city that has been disparaged as a failure." DETROIT -- Chrysler Group CEO Sergio Marchionne praised his company's rank-and-file workers for leading the automaker's rebirth, and warned those in power around the world to ignore growing income gaps in their societies at their own peril. Delivering the keynote address at the Automotive News World Congress Wednesday night, Marchionne, 59, said Chrysler's workers and managers struggled to restore the company. "All of our people, represented and non-represented, have worked together with unwavering dedication to bring Chrysler back from the brink," Marchionne said. "And it is only right that all should share in the success so far and in the wealth that we hope to create in the years ahead." He recalled touring the Jefferson North Assembly plant in Detroit prior to Fiat S.p.A.'s taking control of Chrysler in 2009, and finding it in a state of "industrial neglect." But while the plant was shut down, he said, workers there rejuvenated the plant: painting, taking out tons of scrap, and eliminating 308 unsafe conditions. The plant makes the Jeep Grand Cherokee and Dodge Durango, and will also make a new SUV for Maserati. Last week, Chrysler said that it would add 1,100 jobs at the plant in early 2013 to expand production of its hot-selling vehicles. "This is a story of revitalization in a company that was regarded as irrelevant, set in a city that has been disparaged as a failure," Marchionne said. The Fiat-Chrysler boss said the protests that have rocked nations and roiled markets are rooted in inequality that weakens societies and is bad for business. "Political instability is disruptive to an economy, and it discourages investment," Marchionne said. While some income inequality is natural, too much leads to an unsustainable society, he added. "These issues call into focus the moral responsibility of our actions," he said. 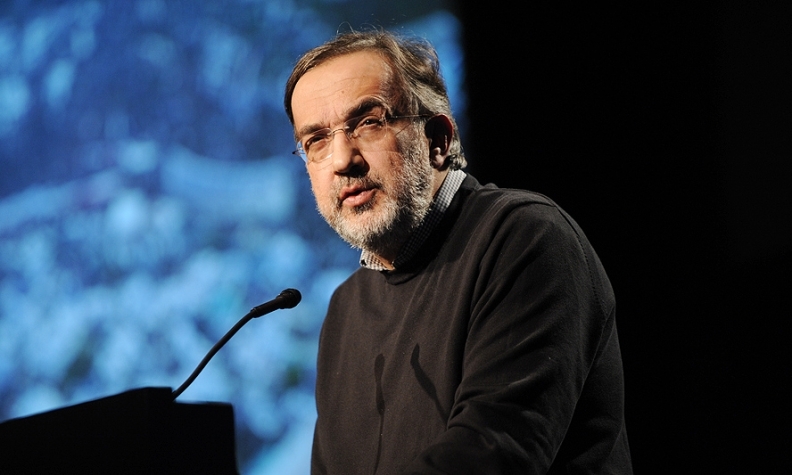 In other remarks, Marchionne discussed the North American auto industry's "transformational change" during 2008-2009, and said European automakers and governments must take the same bitter medicine to ensure the survival of European automotive manufacturing. He had a warning for some Italian industrial unions' efforts to block what he said are needed labor reforms in the country: "If they keep on blocking the process, then Fiat would have no choice but to continue to reduce its exposure" there. Marchionne also said diesel engines are being studied for Chrysler's larger vehicles, including the Jeep Grand Cherokee, which will get one next year. But he said he doubted the engines would migrate to the automaker's smaller vehicles.